A New Map of Italy, together with the Adjoyning Islands of Sicily, Sardinia, and Corsica, Shewing their Principal Divisions, Cities, Towns, Rivers, Mountains etc. 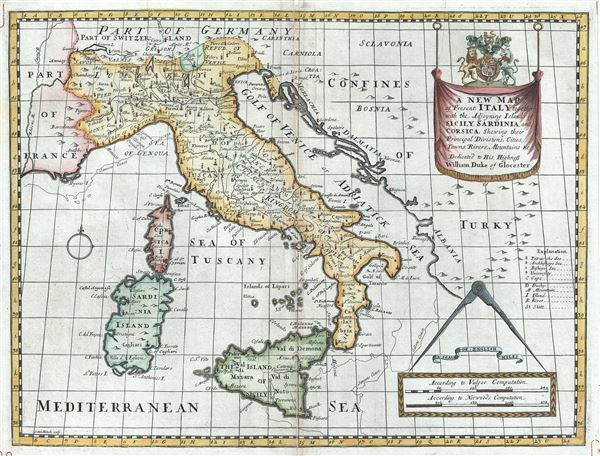 This is an uncommon 1712 map of Italy inclusive of the adjoining islands of Sardinia, Corsica and Sicily by Edward Wells of Oxford. It extends north as far as Lake Geneva and Germany and from France to the Gulf of Venice and the Adriatic Sea, noting towns, cities, rivers, mountains, islands and other topographical features. At the time this map was made, most of Italy was under Spanish control. Following the War of Spanish Succession, Spain would lose many of its territories in Italy to Habsburg Austria, making Austria the dominant power in Italy.